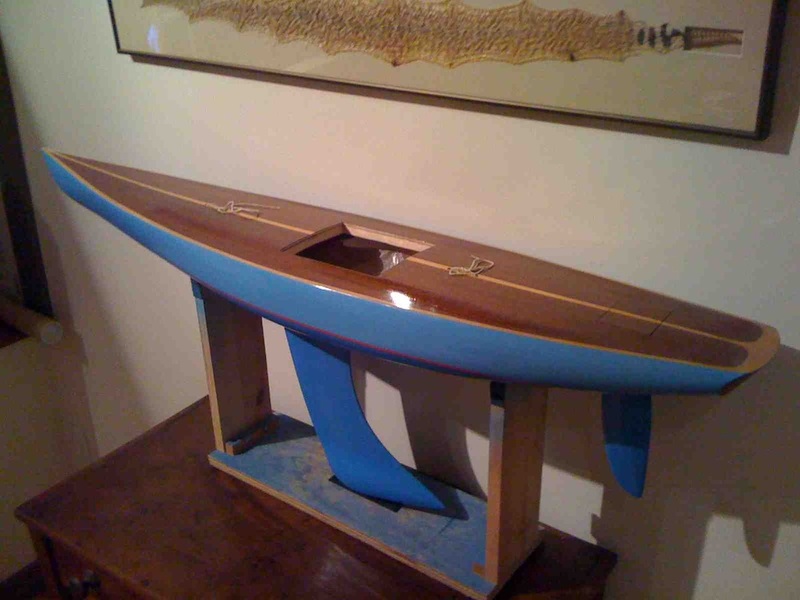 This vintage style Marblehead sailboat was build by Bruce Richter. 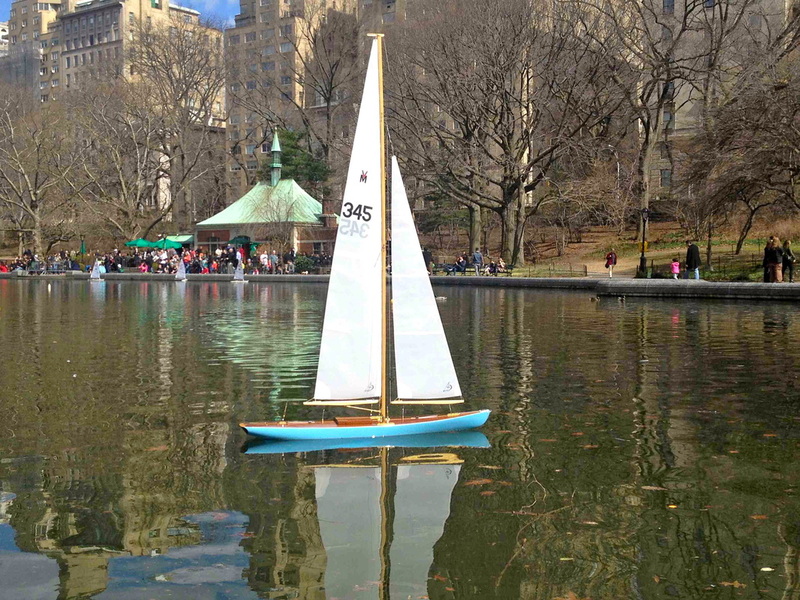 It was awarded the 2013 and 2014 Craftsmanship Award by the US Vintage Model Yacht Group. 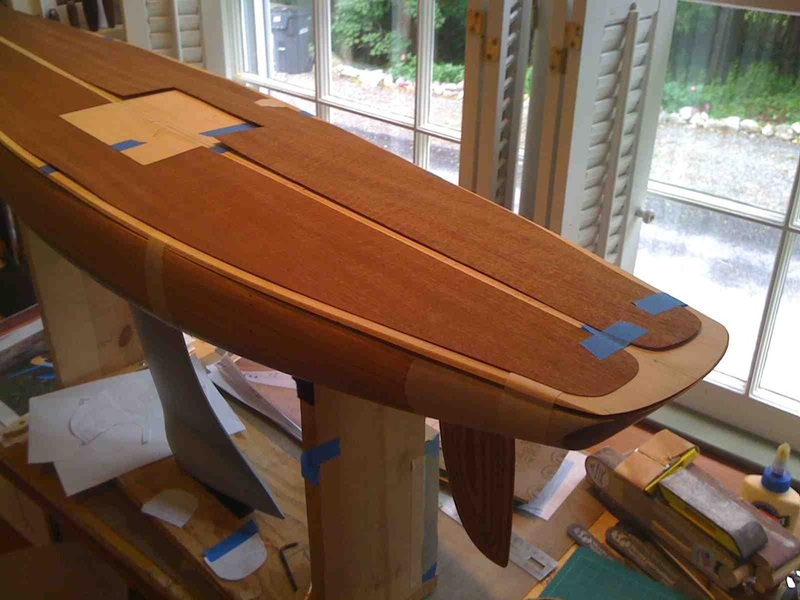 Bruce began the project in Thom McLaughlin's "Build Your Own Plank Constructed Pond Yacht" at The Wooden Boat School in Brooklin, Maine ("Stuart Little" author E.B. White's hometown)and completed the boat over a span of two years. The plans for this "Rusticator" design sloop were influenced by free-sailing model sailboats from the late 40's, 50's and early 60's and were developed by Thom McLaughlin of Sublime Boatworks. This and other vintage and vintage-style RC sailboats race in the AMYA Vintage Marblehead (VM) 50/800 (50" overall length/800" sq. in. of sail area) class. The station mold frames and keelson "backbone" are set up on a building board and prepped for planking. 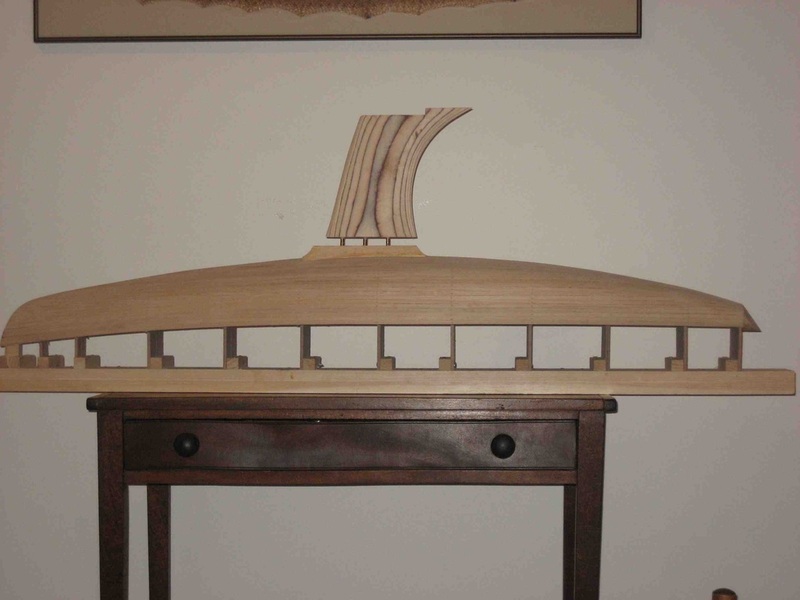 The process of planking over the frames, working from the bottom up, is about 75% complete at this point. Toothpicks hold planks in place while glue between planks dries. 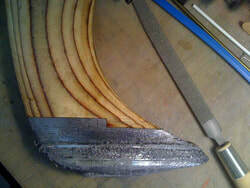 Faring is done after planking is completed. After the hull is fared, the keel is shaped and connected to the hull via metal rods and epoxy. Lead roof flashing sheets are trimmed, stacked, epoxied together, attached to keel and shaped for the ballast. 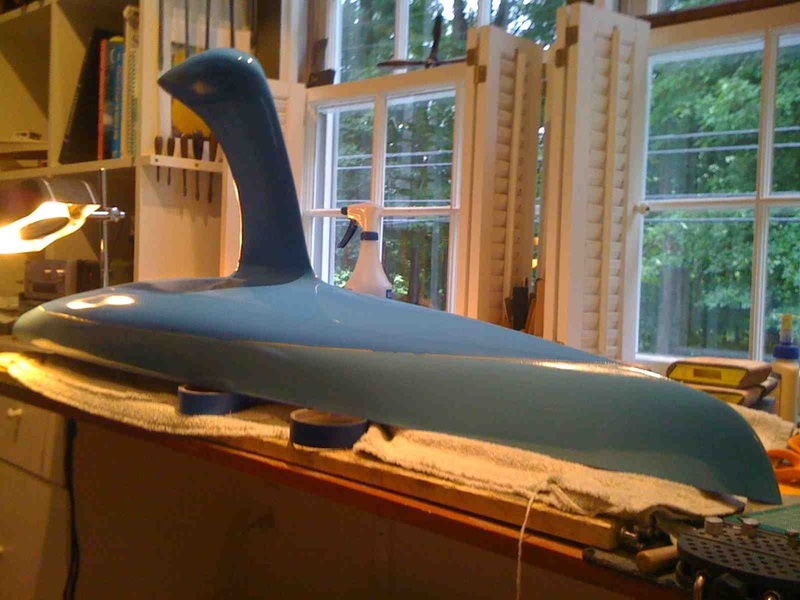 After a final shaping and sanding, the hull and keel are given several coats of epoxy then sanded. Mahogany and spruce veneer is cut and fitted to the plywood sub-decking before being applied with epoxy. The dreaded painting process of the hull begins. Then it's onto sanding, buffing, and polishing. 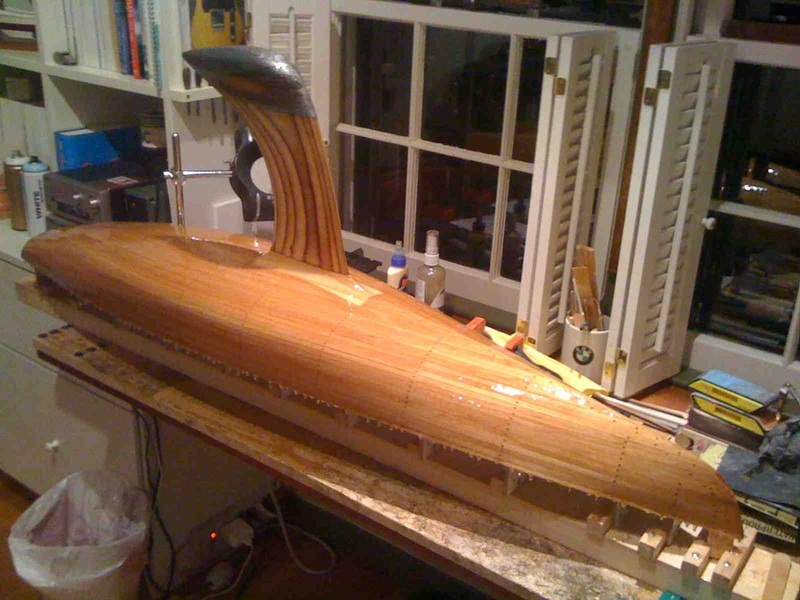 After the deck is glued to the hull, it gets a few coats of epoxy, sanded and finished with several coats of varnish. After building the rigging, setting the sails, installing the radio gear, testing and adjusting, thar she floats.